Financial Justice: The People's Campaign to Stop Lender Abuse tells the inside story of how an alliance of progressive consumer, civil rights, labor and fair lending groups (including Consumer Action) challenged Wall Street and the financial services industry in the aftermath of the financial crisis of 2008-2009. To the surprise of many who had underestimated the frustration of consumers and the power of non-profit advocates, the grassroots campaign won major consumer protections including the Dodd Frank Act, which created the Consumer Financial Protection Bureau (CFPB). 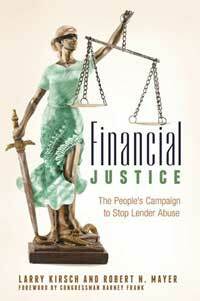 Based largely on extended interviews with more than 30 of the leading advocates, Financial Justice introduces readers to the players and follows the rocky history of the Consumer Financial Protection Bureau from the initial vision of Elizabeth Warren through the roller-coaster deliberations of a fractious Congress and on to its final passage. The authors argue that the rare victory of average citizens over powerful financial interests was achieved because of concerted action on several fronts: a coalition approach to advocacy, strong congressional leadership and the painful effects of the financial crisis on working and middle class Americans. Congressman Barney Frank writes the foreword, and Professor Norman I. Silber contributes an afterword based on an interview with now-Senator Elizabeth Warren. Robert N. Mayer, PhD, is a professor in the Department of Family and Consumer Studies at the University of Utah. His published works include ABC-CLIO’s Encyclopedia of the Consumer Movement and The Consumer Movement: Guardians of the Marketplace (Twayne Publishing). He serves or has served on the editorial boards of multiple journals and on boards of directors of numerous organizations, including the Consumer Federation of America, the Consumer WebWatch Program of Consumers Union, the National Consumers League, and DebtorWise Foundation. Mayer holds a doctorate in sociology from the University of California, Berkeley.